The game of Caribbean Stud Poker is a casino game, not a poker game. The difference is that in a real poker game, you’re playing against the other players. In a casino game, you’re playing against the house. One of the best examples is blackjack, which is game in which the other players’ totals don’t matter one whit. The only totals that matter (to you) are yours and the dealer’s. Understanding Caribbean Stud Poker strategy begins with understanding that it’s a game where you play against the house. Caribbean Stud Poker became popular originally on various casino-friendly Caribbean island, hence the name, and then it became popular on ships where gambling was allowed. It has since spread to mainstream casinos in destinations like Las Vegas, Reno, Atlantic City, and others, and it’s continued to grow popular since its introduction. I used blackjack as an example earlier, and it’s an appropriate one, because a Caribbean Stud Poker tables looks almost just like a blackjack table. It’s a semi-circular table with room for a single dealer on one side and seven players on the other side. Caribbean Stud Poker is played with a 52 card deck, which is usually randomized using an automatic shuffling machine. On the players’ side of the table, each player has a spot on the table where she can place an “ante” and a spot where she can place a “bet”. Caribbean Stud rules are much simpler than most poker variants, though the rules are similar to poker games you’ve played. In fact, one reason Caribbean Stud Poker is so popular is the hand ranks are the same as in Texas Hold’em. Those new to the game might need a primer on the Caribbean Stud Poker hands, so we’ve included a table below as a study guide. The top hand is best, while the bottom hand is worst. Royal Flush: A-K-Q-J-10 of any one suit: Hearts, Diamonds, Spades, Clubs. Straight Flush: Any 5 cards in a sequence of any one suit. Four of a Kind: Four cards of the same rank. Full House: Three of a kind, plus a pair. Flush: All five cards of one suit: Hearts, Diamonds, Spades, Clubs. Straight: Any 5 cards in a sequence. Suit does not matter. Two Pairs: Two cards of the same rank, plus (another) two cards of the same rank. High Card: Ace is best. In descending order, A-K-Q-J-10-9-8-7-6-5-4-3-2. The ante is a mandatory bet, and if you want to play, you have to make the ante bet. Once all the players have made their ante bet, the dealer takes sets of five cards for each player and for herself from the automatic shuffling machine. The dealer then reveals the top card of her five card hand to the players, who haven’t looked at their cards yet. Once she reveals her top card, she’ll push your five card set closer to you. That’s when you can look at your hand. You can then decide how good you think your five card hand is. This requires an understanding of the standard ranks of poker hands. If you don’t think you’re likely to win, you can fold. If you fold, you lose your ante, but no further money. On the other hand, if you like your hand, to stay in you have to place an additional bet, which is always twice the size of the ante bet that you placed earlier. For example, if the ante were $10, and you liked your hand, you would place an additional $20 in order to continue playing. After the players have each either folded or bet, the dealer reveals her cards and arranges them into the highest-ranking poker hand she can. She tries to “qualify.” That means her poker hand needs to be Ace-King or better; if her hand is lower in rank than that, the dealer doesn’t qualify. If the player loses, then the house gets both her ante and her bet. If there’s a tie, the player gets her ante and her bet back, but no winnings. If the dealer doesn’t qualify, then all the players who stayed in win. But there’s a catch, and it’s important. They only win their ante bet. The other bet is returned, but not paid off. This can be the most irritating aspect of Caribbean Stud Poker. Suppose you’re dealt a royal flush. If the dealer doesn’t qualify, you only get even money on your ante bet. The payouts in the chart above ONLY matter if the dealer qualifies. Gambling games are games of exceptions to the rule, and Caribbean Stud Poker is no different. You do have an option to get paid off even if the dealer doesn’t qualify, and that’s the progressive jackpot. The progressive jackpot bet is a third bet available to Caribbean Stud Poker player. This bet usually costs $1 to play, but it gives the player the opportunity to win a progressive jackpot that’s usually over $100,000. If your hand is a flush or better, you can win some or all of the jackpot. The amounts of these winnings vary from casino to casino, but the table below lists some of the more common payouts on the progressive jackpot bet. If more than one player qualifies for the jackpot, usually they’ll split it. But some casinos have a rule that the player closest to the dealer’s left wins the progressive jackpot. The odds of two players getting a straight flush at the same table on the same hand are astronomical, though–if you’re ever in such a situation, write to me and tell me about it. Caribbean Stud Poker is popular, so it can be found at almost all online casinos. However, it is important to choose the best Caribbean Stud Poker casino to play, because offer a bigger bonus or a bonus with a better wagering requirement. Some online casinos also have better bet limits for your bankroll, or better odds on the Caribbean Stud Poker bonus bet. Finally, when it’s time to withdraw your winnings, some online casinos pay on time and some don’t, so researching the best site is important. Slots.lv offers a $5,000 welcome bonus on most payment methods and a $7,500 bitcoin welcome bonus. Caribbean Stud Poker has a 20% contribution rate on both of these bonus promotions. For every $100 wagered on Caribbean Stud Poker, it contributes $20 to clearing the wagering requirement. 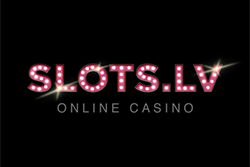 Slots.lv supports live dealer games on smartphone or tablet computers. BetOnline is a good place for high rollers to bet on Caribbean Stud Poker. Their casino advertises a $250 max bet on Caribbean Stud at the moment, with Caribbean Poker also a betting option. BetOnline Casino offers a 100%, $1,000 welcome bonus for new players that includes Caribbean Stud Poker as a play option. 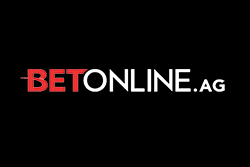 BetOnline also offers a $25 live dealer casino bonus with $5 to $100 bet limits, but their live games are limited to roulette, blackjack, baccarat, and Casino Hold’em. Caribbean Stud Poker does have some rules that players should be aware of. One important rule is that you’re not allowed to share information about what’s in your hand with the other players in the game until the showdown. Rule #1: You can only play one hand per game. Rule #2: You must keep your cards within view of the dealer at all times. Rule #3: You can only touch your cards once. After you’ve examined them and made your decision, don’t touch them again. Rule #4: The Dealer Must Qualify – The dealer must qualify with an ace-king or higher or the player automatically wins the Ante Bet. The lowest qualifying hand would be A-K-4-3-2, while the highest non-qualifying hand would be A-Q-J-10-9. If the dealer fails to qualify, the player would win the ante bet and the raise bet would be a push. Rule #5: Progressive Side Bet – The progressive side bet is based entirely on the strength of your own Caribbean Stud Poker hands. The strength of the dealer’s hand does not matter. Look at the Caribbean Stud Poker pay table to see whether you win and what your winnings might be. The house edge in Caribbean Stud Poker will vary according to the payout schedule for the progressive jackpot, but it’s usually around 5%, making it comparable to roulette, mathematically. The house edge comes from the betting structure. 44% of the time, the dealer won’t qualify, so you’ll only win your ante. The other 56% of the time, the dealer will qualify, and you’ll have about a 50/50 chance of beating the dealer. But in order to stay in the game and try to beat the dealer, you have to triple the amount of money you’re wagering. (Remember–the bet is always twice the size of the ante, and you have to place the bet in order to stay in the hand). You should always make the bet if you have a pair or better. You should also make the bet if you have an Ace King and at least one of your other cards matches the dealer’s upcard. You should also make the bet if you have Ace King Queen or Ace King Jack and ANY of your cards matches the dealer’s upcard. If you hold Ace King Queen and two other cards, make the bet if the higher of those two other cards is higher than the dealer’s upcard. If you play with this strategy, and if you avoid the progressive side bet, you’ll be giving the house an edge of 5.22%. If that strategy seems too complicated, you can follow a much simpler strategy and only give up 0.1% on the game. The simple strategy? Bet if you have AKJ83 or better; otherwise fold. The simple strategy for Caribbean Stud Poker gives the house an edge of 5.32% instead of 5.22%. If the progressive jackpot is over $352,150, the you have a mathematical edge over the casino when you make the optional $1 side bet. You’re still unlikely to win, but any time you can get an edge over a casino, it’s worth making the bet if you can afford it. If the progressive jackpot is under that amount, don’t make the side bet, because the house has the edge. Caribbean Stud Poker is a lot of fun, and usually the other people playing at the table with you are social and some of them are even inebriated. It’s a game worth playing if you like slow, social card games where you don’t have to compete with the other players at the table. I’m indebted to American Mensa Guide to Casino Gambling: Winning Ways by Andrew Brisman for most of the information presented on this page. Strategy might give you an overview of how to play a game, but the Caribbean Stud Poker tips below provide in-game tactics you’ll use to execute the strategy better. Follow the tips below and you’ll have a bigger bankroll and enjoy Caribbean Stud Poker sessions better. Tip #1: When to Raise – Always raise when you have a pair of better. Raise with an Ace-King in any of the follow three scenarios. Raise when the dealer’s card is 2 thru Queen and one card matches your own. Raise if the dealer’s card is less than your 4th-highest card and you’re holding a Queen. Raise if the dealer holds an Ace or King and you have a Queen or a Jack in hand. Tip #2: When to Fold – Always fold with less than an Ace-King. If you hold an Ace-Queen, fold the hand. Do not hesitate to fold with an A-Q or worse. This is less than the dealer’s minimum qualifying hand, so it’s a sure loser. Also fold when you hold an Ace-King and none of the 3 scenarios in Tip #1 are given. It’s hard to throw away chips, but dumping your chips in this situation is the optimal play. Caribbean Stud Poker is a casino game with specific odds. Players make informed decisions when they know the expected return, so let’s take a look at the Caribbean Stud odds and payout charts. Even though the payouts are quite simple, Caribbean Stud has a main game and a side bet, so the pay tables confuse some people. We provide printable Caribbean Poker odds and payout tables below, so you can have the numbers in front at your wide while you play. Though the odds of getting a top hand are very low, it is still possible. When you aren’t winning the top payouts, you’ll win a lot of smaller payouts. Remember that you only need to beat the dealer to win. The dealer busts 22% of the hands, so that represents a large part of your chances to win a payout when playing Caribbean Stud Poker. 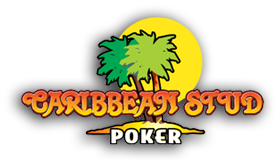 Those who place the side bet in also need to know the Caribbean Stud Poker side bet odds and payouts. It can be difficult to know the right Caribbean Poker Strategy for the side bet, because there are 10 separate side bet pay tables commonly used. In all versions, the royal flush pays out 100% of the jackpot. 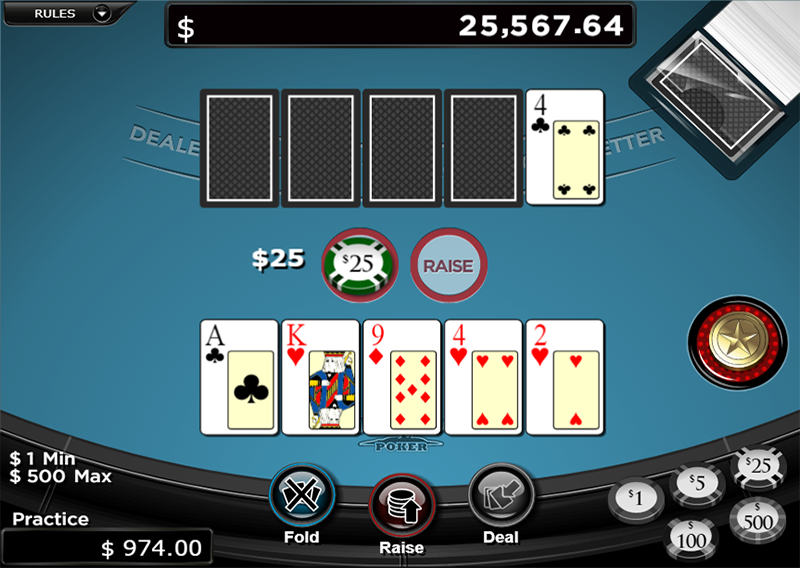 In most versions, the straight flush pays out 10%, but occasionally this hand pays out a flat jackpot. The differences are how the four of a kind, full house, and flush are paid. You need a strong hand to win the side bet, but Caribbean Stud Poker payouts for the bonus game are large. The side bet has a winnable progressive jackpot, which a whole new dynamic to your Caribbean Poker Strategy. The breakeven point on the progressive side bet is between $176,611.05 and $263,205.26, depending on the payouts on the non-progressive hands. The average house edge on the side bet is 26.46%, which makes this a sucker bet. That’s the case with progressive jackpot games in general, but the accumulated pots add a lot of fun and excitement to the game for some players. Live Caribbean Stud Poker is played online in the live dealer section of a casino website. 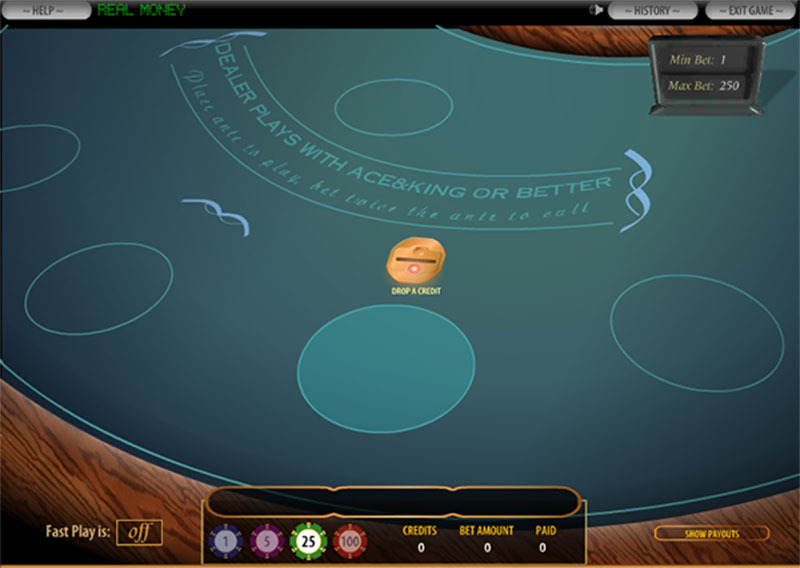 A real-life dealer in a casino studio deals the cards while they online casino streams the video live in real time to your computer or mobile device. The best online casinos these days use live dealer software to provide table games like roulette, blackjack, and Caribbean Stud Poker. Playing Caribbean Stud with a real dealer offers several benefits. When you play Caribbean Stud Poker with a live dealer in the mix, you do so from the comfort and privacy of your own home. The downside to traditional online Caribbean Stud Poker is the use of random number generators and video simulations, but for players who prefer real people dealing a real hand of cards, that impediment is no longer necessary. Online casinos staff their live dealer studios with attractive, friendly dealers. These staff members provide conversation and entertainment throughout the Caribbean Stud Poker session. If you have questions, a real person answers them. Live dealers provide a personal touch that no software ever could. The random number generators used by casinos are 35-year-old technology, so they’re reliable and trustworthy, but table games were designed to be played with real dealers. Live dealer Caribbean Stud Poker restores the game to the way it first gained its popularity. Cutting edge streaming video keeps the camera on the cards the entire time they are dealt. Many live dealer casinos send around a bonus attendant who offers special bonuses throughout the game session. These might be free giveaways or fun bonus Q&A games, where you win freeplay money for winning the game. These moments enhance the excitement of playing with real life people in the mix.